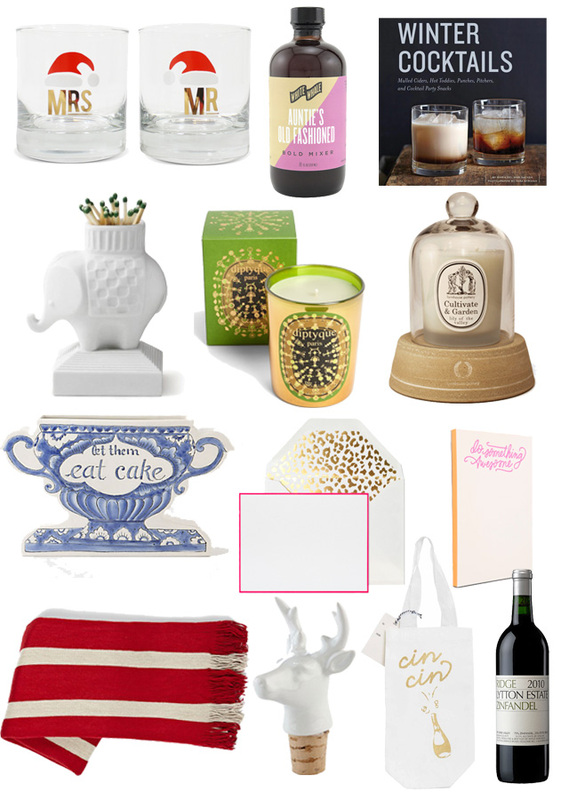 The combination of adorable tumblers and a drink mix, or a drink mix and a book of cocktails, or any combination of the three would be great for a couple hosting a party. I think I post these glasses every year because I love them so, and I have actually given them as hostess gifts myself, so I can vouch for how cute they are! In the candle category, a favorite home accessory of mine, I have the Diptyque winter scented candle. These are the gold standard in candles, and the Christmas patterns are just lovely. Pair that with an adorable match strike for a really generous gift! Or, what about this candle cloche? I didn't even know what a candle cloche was until I saw this, but I think I love it! I have long admired this adorable Anthopologie vase, so I thought I'd throw it into the mix. Paper products also make a good gift, like these note cards or this whimsical pad. Personally, I don't think a home can ever have too many throws, and West Elm has a number of throws on sale for some seriously amazing prices. (This one is only $39!) And, to bookend this guide, let's wrap up where we started: with the alcohol. How about a fantastic bottle of wine (Ridge is divine), an adorable wine tote, and a festive bottle stopper? I'd be pretty stoked to receive this (if I could currently drink). Let the parties commence!